This article was originally published by the Small Wars Journal on 15 January 2019. Before he resigned, former Defense Secretary James Mattis was reportedly working in conjunction with the Department of State to revise US policy in the Middle East. Whatever vision Mr. Mattis had will have likely died when he left office – but he had the right idea in undertaking a review. Our strategic situation in the region has changed since the turn of the century, but our basic strategy has remained largely intact. That is not necessarily a good or bad thing, but it does suggest that a review of political-military strategy in the region is prudent. Militarily, we maintain a series of major bases in Bahrain, Kuwait, Turkey, and Iraq with smaller support presence in Jordan, Qatar, and Israel. We have also maritime prepositioned equipment in Diego Garcia in the Indian Ocean and maintain a forward deployed naval presence in the region headquartered in Bahrain. Diplomatically and militarily our strategic agreements are bilateral, as they are in the Pacific and the Indian Oceans. There is no NATO-like alliance in the region. What has Changed? Perhaps the most profound change is that we are no longer dependent on the Middle East for oil. A combination of decreasing use of non-fossil fuels, high mileage vehicles, and increased domestic oil production has radically reduced our energy dependence on the Middle East, and that trend will continue into the next decade no matter which party governs. The Republicans will continue to push domestic fossil fuel production while the Democrats will increasingly strive for alternatives to the traditional reliance on fossils. Either way, dependence on the Middle East for energy will continue to decrease. Many Pentagon thinkers and politicians have yet to realize it, but the region has slipped down on the list of vital national interests. Secondly, Israel no longer faces an existential threat from its most powerful Sunni Arab neighbors. The Camp David Accords regarding Egypt are still in place, the Syrian Civil War has defanged the Damascus regime as a front-line Arab state, and Israel has quietly improved relations with Saudi Arabia and other Sunni states. However, the Syrian situation has given Iran a corridor to threaten Israel that did not previously exist. As a NATO member, Turkey has generally been considered more of a European than a Mid-East state, but that has changed since the turn of the century. Ankara has been much more proactive in the region under the Erdogen regime. It has also become more authoritarian, and US-Turkish interests have increasingly diverged. This is particularly true in regarding the Kurds in Syria and Iraq. Finally, after three decades, Russia is back in the region as a serious player. This may not be a vital American national interest, but is certainly a factor, and a Russo-Iranian axis would be of concern to our Sunni friends in the region. A total withdrawal from the region is neither feasible nor desirable to all but the most rabid isolationists in our country. The basing we have in Kuwait, Bahrain, Turkey, Diego Garcia, and elsewhere in the region would be key to our strategy in fighting any major conflict – to include the Pacific. Abandoning Israel completely would be politically unacceptable to either major party. The Trump administration wants allies to do more throughout the world but has never suggested a total withdrawal. Essentially, we have three major strategic options to consider in any review of our political-military posture in the region. Doing nothing is always an option but maintaining a regional diplomatic and military posture with some reductions in military force structure and more pressure on human rights on some bilateral partners is not only feasible but is the most likely option in the immediate future. Some sub-options might include bringing more pressure on Saudi Arabia and Egypt on human rights issues and on Israel regarding a solution to the Palestinian problem. This will almost certainly happen the next time the Democrats gain the presidency. The obvious drawback of this is that the Saudis and the Israelis might well seek other partnerships, particularly with China. The counter-argument would be that such a shift would not be a crucial loss because we do not need the region as much as in the past. However, we need to realize that the growing quiet partnership between Egypt, Saudi Arabia, and Israel will be the key to any new security relationships in the region. That will happen with or without us. Almost certainly, there is a near-term need to urge Iraq to curb the power of Shiite militias in the areas formerly controlled by ISIS. Many who watch Iraq argue that failure to curb these militias will almost certainly lead to the rise of another insurgency – either led by a resurgent ISIS or by tribal groups hostile to the neglect of Sunnis by the central government. However, any leverage we have in this area is contingent on the limited – but effective – presence we maintain in Iraq. The absence of such a presence allowed for the rise of ISIS after 2011. One military sub-option that merits serious consideration is to cease maintaining a pervasive aircraft carrier presence in the region and replacing it with a more distributed form of forward naval power. The rise of access denial anti-navy capabilities by Iran, China, and Russia in the last two decades has made carriers more and more vulnerable. The recent development of a Russian hypersonic missile capability has exacerbated carrier vulnerability – but it is too early to write off the carrier as being obsolete. For every technological breakthrough, a counter always arises. Carrier presence remains a strong signal of American resolve in any region. However, the loss of such a vital asset could have much the same strategic morale impact as the loss of the battleships Prince of Wales and Repulse in the Indian-Pacific theater in World War II. It may be prudent to use our attack submarines and other forms of surface combatants to demonstrate American resolve in the region. More emphasis on distributed surface and air assets as well as submarines armed with precision guided munitions are as militarily potent as carriers and less militarily risky. A new naval strategic mix should at least be considered. If the decision is made to keep a carrier presence in the region, a sound tactical precaution might be to distribute large portions of the carrier air wing to remote airfields ashore in a shell game concept to avoid losing much our regional naval airpower in a single strike. The same can be said of the Amphibious Ready Groups with Marine Expeditionary Units (MEUs) aboard. The Marines have begun placing smaller Special Purpose Marine Air-Ground Task Forces (SPMAGTFs) ashore at expeditionary air fields where they can still respond to crisis situations. This was originally done as a result of not having enough amphibious ships to keep a continuous presence in dangerous areas post-Benghazi. However, it may be prudent to split the MEUs into several smaller SPMAGTs when they are on station in the region to avoid losing the whole organization in a surprise strike on their ships. Overall, there are good reasons for a basic continuation of our current strategic approach to the Middle East. The strongest argument is that it has worked relatively well. With the temporary exception of the 1990 Iraqi invasion of Kuwait, deterrence has been maintained and successful. We may no longer be dependent on the region’s oil, but our allies in both Europe and Asia still are. If we fail to provide naval assurance of free flow of oil, someone – probably China – will take up the slack. Detractors of the current policy will argue that it is becoming an unnecessary expense. A decision to deemphasize the region strategically would be a major political one, but it remains an option. This approach might also be labeled “If I Can’t Have it, You Can’t Either”. The Russians and Iranians have propped up the Assad regime in Syria. The Iranians have conducted hybrid warfare in Yemen and are causing problems in Iraq, Lebanon, and Gaza. 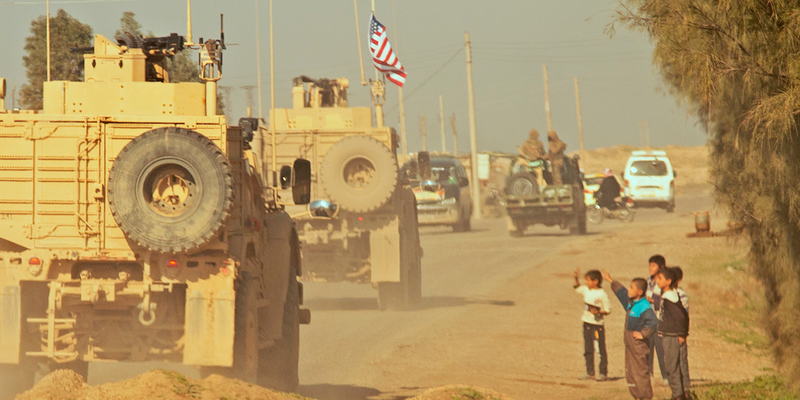 U.S. presence in Iraq as a result of the war on ISIS has somewhat offset Iranian influence, and our presence in Syria has slowed the expansion of the Russo-Iranian influence in that country. However, the recent decision to eventually withdraw the US presence in northern Syria will likely open new inroads for both Russia and Iran. A conscious US decision to use hybrid warfare in the gray zone between peace and conventional war – particularly in Syria – would be a relatively cheap method of undermining the corrosive effect that those two nations have had on western attempts to introduce democracy or modify the behavior of the Assad regime. Gray zone actions might include propaganda, cyber operations, the use of surrogate militias and armed mercenaries. To be sure, the United States has done some of this in Syria and Yemen already. It has armed Syrian opposition groups and encouraged the Kurdish YPP militias in their fight against ISIS. However, a true Hybrid Warfare campaign would entail putting our support to anti-Assad militias and the YPP on steroids. This would include anti-tank systems, air defense assets, and other conventional weapons and training with the objective of turning the Russo-Syrian effort into a true quagmire that would cause Russian casualties to escalate to the levels of the Russo-Afghan war. The Iranian economy is reeling under sanctions, governmental incompetence, and unwise overseas adventures by the Iranian Revolutionary Guard’s Quds Force. The curtailment of adventures in Syria, Lebanon and Yemen would alleviate some Iranian domestic pressures. US support of anti-Hezbollah fighters in Lebanon might force that group to bring its forces back home from Syria. The promise of US help in “modifying the behavior” and anti-Iranian and Russian forces in Syria might well be a relatively cheap bargaining chip in gaining their support for radically reforming or replacing the Assad regime and in getting a better deal on Iranian denuclearization than the one the Trump administration negated. However, there are definite drawbacks to such an approach. First, offensive hybrid warfare in the gray zone has been less than totally effective. Sixty percent of offensive hybrid wars since the end of the Cold War have ended in failure or remain in stalemate. The Serbians saw it blow up in their faces in the 1990s and the Russians have become bogged down in the Donbas in Ukraine. That said, a stalemate would cost the Russians and Iranian more than it would the United States as our involvement would be indirect. Additionally, both Iran and Russia might choose to retaliate against US troops in Iraq, while both the Iranians and the Russians might cause further mischief in Afghanistan. The gray zone is a largely negative approach and would likely draw criticism from human rights groups that are now largely focused on Assad’s allies. Such an approach is feasible – but would need to be very carefully thought through. In 2017, the administration floated the idea of a Mideastern NATO of Sunni states that would be primarily be aimed at deterring Iran. Retired Marine Corps General Tony Zinni agreed to try to facilitate the idea, but he first had to mediate a dispute between Qatar and several of its neighbors. After giving the effort his usual professional best, General Zinni wisely put it in the “too hard to do box” and recently resigned. There are several factors that make such an effort a challenge. First, unlike NATO, none of the potential participants is a functioning democracy. Second, as in the Indian-Pacific region, the security agreements that we have with individual regional states are bi-lateral; some of these nations hate each other almost as much as they hate the Iranians. Finally, such a treaty might well get us sucked into an unwanted Sunni-Iranian religious war that could turn into a regional conflagration rivaling the Thirty Years War in its savagery and duration. Some analysts feel that such a conflict is inevitable. If it occurs – even without initial US involvement – we will have to decide if we want to participate or if we want to try to be a sympathetic third party. There is also Iraq to consider. Although a predominately Shiite populated country, the United States is trying to nudge it into a system of governance that is more inclusive of its Sunni, Kurd, Turkmen, and Christian minorities. An anti-Iran alliance would complicate that effort by forcing the Shiite leadership to choose sides or remain neutral, thus reducing our leverage. However, from a Trump Administration standpoint, there are several potential advantages to a regional alliance. The foremost is that if all participants agreed to pay a NATO-like share of the regional defense burden, it would help the President to fulfill his campaign promise to make allies pay more for their own defense. It would also force the Russians to decide whether to side with Iran – which would eventually lose a regional conflict – or decrease its now growing regional influence. Any such alliance would almost certainly include Israel as a silent partner, this is neither inherently good or bad from a US standpoint, but it would likely bolster Israel’s regional position. In any case, such an alliance would be hard to craft and rife with many drawbacks. If it is feasible at all, it might well start with a smaller group with similar interests. The European Coal and Steel Community – he predecessor of the EU – began small and grew with success. It would also be advisable to begin as an anti-terror rather than an anti-Iranian alliance. None of these options is mutually exclusive, but the second and third would represent a fundamental shift away from the way we have traditionally done business in the region and would represent a reorientation of the way we view Russia and Iran and their regional role. To date, we have tended to view Russia as a sometimes partner – particularly regarding limiting Iranian nuclear ambitions – and sometimes rival. The gray zone option would almost certainly place them in the rival category, and we would be viewed as trying to push them out of the region. It might even strengthen a Russo-Iranian axis. Since 1979, we have viewed Iran at best as a troublesome actor and at worst an enemy. Options two or three would send them into the enemy camp and would likely lessen our leverage on the nuclear issue while strengthening hard line elements in the Iranian government. On the other hand, the United States has always been a whipping boy to distract the Iranian people from internal woes. Attempts to “make nice” to them have been rebuffed in almost every instance, and that is not likely to change in the near term. The status quo option is obviously the most likely near-term approach as inertia becomes comfortable. Although our strategic dependence on the region has changed, it has probably not changed that much to gain much public support for a radical azimuth shift in the short run. Syria is not a vital US interest, and the humanitarian refugee crisis -although terrible- impacts Europe for more than it does us. As Israel moves closer to its Sunni neighbors, its survival becomes less of a concern, and Israel has generally been very capable of taking care of itself. What could change this would be a renewal of the Arab Spring in either Saudi Arabia or Egypt. If either nation becomes radicalized – particularly against Israel – it will mean a total reexamination of our strategic posture in the region. Except for the discussion of likely tweaks to the current strategy, this essay is not intended to make recommendations. It is designed to lay out options. The Trump administration is interested in reducing the amount of resources that the United States spends on defending our allies and wants them to spend more, but it has also reaffirmed our commitment to Saudi Arabia, Egypt, and Israel. There is no indication that Mr. Trump has any desire to further reduce our posture in the region other than to end ground involvement in Syria. They have expressed grave concerns about the human rights situation in Saudi Arabia and many have expressed dissatisfaction with the democratic future of Egypt under the current military regime. The Obama regime was much less patient toward Israel’s handling of the Palestinian situation, we can expect that future Democratic administrations would be even less inclined to unquestionably support the Israeli approach to the Palestinians. The status quo has always been a general bipartisan consensus. Any decision to change that in a major way will likely be caused by a significant strategic development such as an Islamic takeover of Egypt or Saudi Arabia or the fall of the Mullahs in Iran. If that happens, it will be good to know our options. This article is published under a Creative Commons license (CC BY-NC-SA 3.0). Gary Anderson is a retired Marine Corps Colonel who has been a civilian advisor in Iraq and Afghanistan. He is an adjunct professor at the George Washington University’s Elliott School of International Affairs.